You might know us as the "farm table experts," the locally-owned business that brings you the best in tables and furnishings that are handcrafted from scratch, fashioned from reclaimed wood, and made by Virginia's finest craftsmen. Where we are more man than machine and the art of craftsmanship lives on! But we're more than just tables. In our new showroom, you'll discover a new vision and a new direction. At Shenandoah Kitchen and Home, you can count on us to transform not just your kitchen but your bathrooms, basement, and other rooms. Our new name, Shenandoah Kitchen and Home, reflects our new focus. We offer furnishings and remodels for every room in your house from living rooms to basements, all of the same top quality you've come to expect from us. We are committed to only selecting the finest items for your home because we believe quality is more important than speed and quantity and our customers deserve the best. We've renewed our commitment to delivering first-class customer service and to always using environmentally friendly practices. We've completely redesigned our displays to make your shopping experience more streamlined and efficient. 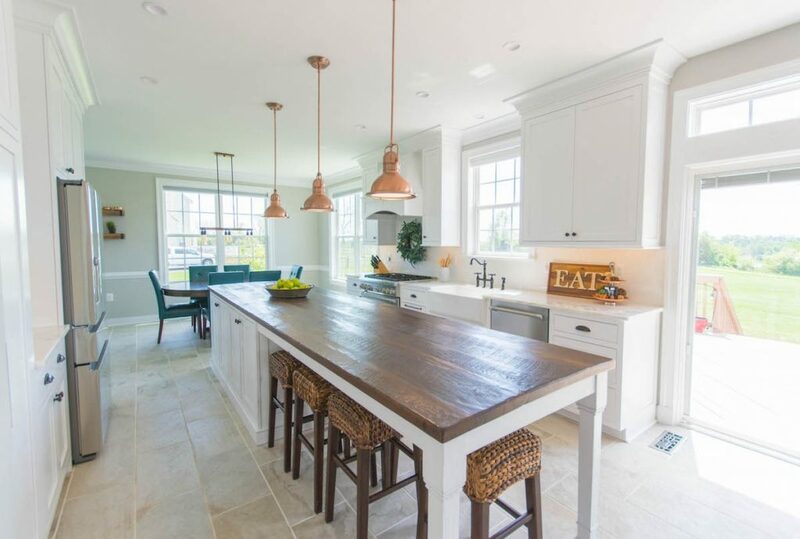 View and choose from Thermador appliances, hand-crafted cabinets, built-in furnishings, stone countertops and tile accents, kitchen islands, and other top-quality materials. Our new showroom allows you to see all of our offerings and inspires you with new ideas. Our new location gives us more parking and easier access. We'll bring the same quality craftsmanship you love in our tables to every item we sell. Reclaimed lumber can become something remarkable. Where pride and quality come first. We don't just want to sell you some furniture, we want to know you and know what you dream of for your home. Count on us to transform every room in your house with a touch of rustic charm which is the Shenandoah style. Our aim is to be your one-stop shop for every upgrade and remodel. We have a modern new showroom and a new vision, but at Shenandoah Kitchen and Home, we still believe in values like honesty, fairness, and integrity. Some people call those old-fashioned. We call them the basis of our business and the only way we operate. When you deal with us, you're dealing with family. When we started selling our handcrafted tables, we envisioned a business that would give modern consumers what they want while honoring the past. As our many longstanding customers can testify, we have remained true to that original vision. Now we're building for the future while still preserving the best of our Virginia heritage. There is nothing like the warm, handcrafted beauty of Shenandoah style. You'll love the way it makes your home look richer and more inviting, with all the charm of history. It can be yours today with a simple call or visit to Shenandoah Kitchen and Home. Stop in and visit our new showroom at 201 North Maple Avenue, Unit E in Purcellville. Don't forget to ask about your FREE powder room consultation during the month of September! We look forward to seeing you.